Life below the Mason-Dixon Line is, well, hot. I am pretty sure I left a sweat mark in the shape of the Sweet Baby Jesus on my mom’s car seat today. I might try to sell it on eBay. Anyway, it is Throwback Thursday, and I feel how this ice cream truck looks. 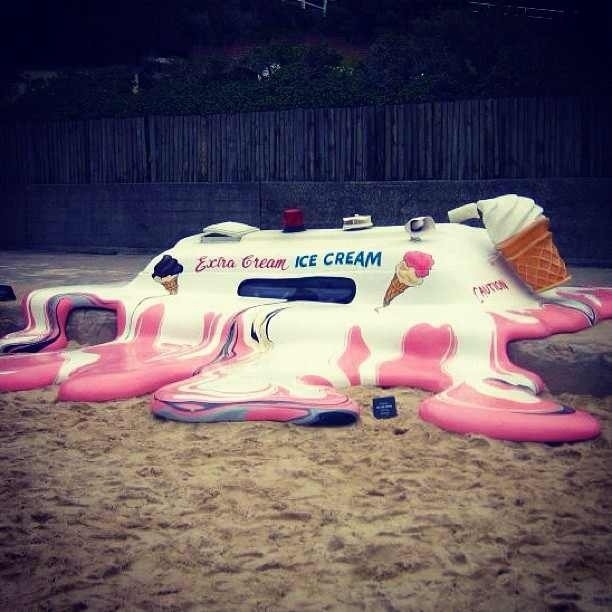 A commentary on global warming by artist Orest Keywan, this melting ice cream truck took the $30,000 grand prize in the Australian Sculptures by the Sea exhibition in 2006. Mr. Softees everywhere shared a moment of silence for their fallen brother. I had fried chicken for breakfast! Fruits and vegetables are for sissies. Overheard at Wal-Mart today – a married couple having a legit fight over whether to buy Velveeta or Kraft Mac and Cheese. It got heated. Kraft won, but the husband’s sleeping on the couch tonight. I saw a bookstore called “White Wing” which I thought was funny when I said it out loud to myself (assuming it was a play on “right wing”). But then I wondered if they didn’t mean it to be funny and felt bad for maybe being a cynical New Yorker. My Place or Yours: Bath Houses, Potholes, and Landfills, Oh My! I’ll start the opening bid for the baby Jesus sweat mark at 50 cents!